Police say at approximately 4:15 AM, emergency services including frontline officers from the Prince George RCMP, responded to a report of a single vehicle collision at the intersection of Highway 97 and Highway 16 in the merge lane. A full size pickup truck crashed into a light standard just after 4 AM. PJXM NEWS PHOTO. All three female occupants of the full size pickup truck suffered serious injuries, one in critical condition. The driver, a 17 year-old Prince George resident, has been arrested for Impaired Driving Causing Bodily Harm. Traffic was delayed for those heading west ontp Hwy 16 Saturday morning. PJXM News PHOTO. 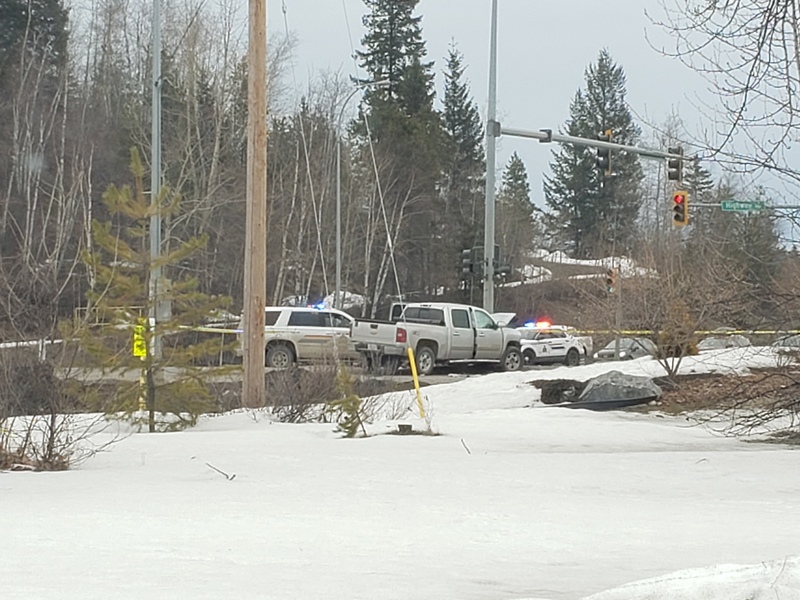 The Prince George RCMP’s Municipal Traffic Services Section has been called in to lead the investigation. A segment of this intersection was closed for most of the morning, but has now been reopened to traffic in all directions. The investigation is in its beginning stages and is expected to take some time. Investigators are wishing to speak to anyone that may have witnesses this collision. If you have any information about incident, please contact the Prince George RCMP at (250)561-3300. The Prince George RCMP would like to thank those members of the public that stopped to assist just after the collision occurred, specifically two off-duty nurses that provided initial medical care.